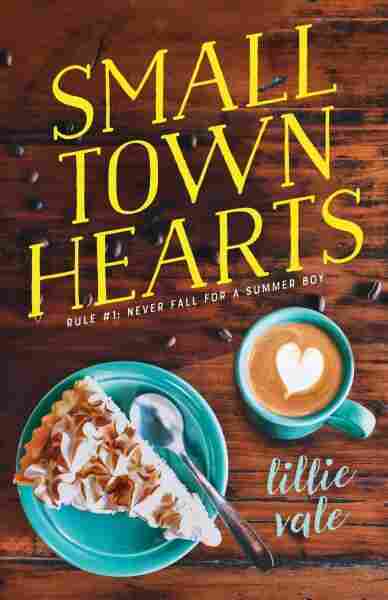 Book Review: 'Small Town Hearts,' By Lillie Vale Lillie Vale's new young adult novel follows Babe Vogel, who's perfectly happy in her small town life, even though her friends have mostly moved on — until a "summer boy" arrives to complicate things. Before Lillie Vale's Small Town Hearts even began, I was struck by the dedication: "To anyone who ever needed a second chance." I'm a sucker for a good dedication. And who among us hasn't ever wanted (or needed) a second chance at something? Once Babe graduated high school, even her mother moved on. But easygoing Babe truly appreciates her quirky home, proving that it's perfectly okay to find one's tribe in one's own backyard. A consummate baker whose delectable creations are sold at the shop where she works, Babe plans to take over the Busy Bean herself one day. She's also been granted permission to live in the town's candy-cane lighthouse, just as long as she gives tours in the summertime. It's a pleasant, peaceful setting for the drama that's about to ensue. When we meet her, many of Babe's friends have left town and gone on to college, including her ex-girlfriend Elodie — a move that broke Babe's heart. Two of her very best friends are still around — Penny and Chad — but there's fallout there, too, as they begin growing into adulthood and deciding who they want to be, and whether or not they even want to be in each other's lives anymore. Each of these characters causes so much drama in Babe's life that every time another one shows up in the story, you brace for the storm blows in with them. Between Chad's apathy and Penny's histrionics, Babe puts up with so much that you begin to wonder why she's even friends with these people in the first place. Which I suspect was intentional on Vale's part — these episodes make the reader look forward to the respite of Babe's calmer, safer moments with Levi, the summer boy. Artist-in-residence Levi Keller is exactly the cushion Babe needs to soften the blow after her best friendships explode. But Babe's Rule #1 is: Never fall for a summer boy. Her father was a summer boy. She knows that summer boys are temporary at best. Any relationship will inevitably end in more heartbreak, which she really doesn't need right now — especially since Elodie is back for the summer and constantly reminding Babe of her loss. 'Small Town Hearts' has just the right amount of drama, at just the right pace. Poor Levi seems to genuinely like Babe, and is both respectful, patient and incredibly kind as she works through all her relationship problems. He doesn't bat so much as an eyelash at Babe's bisexuality. Nor does the book, which I also found a refreshing twist. You want to cheer for the summer boy throughout the book. But should you? Kudos to Lillie Vale, for not only successfully manipulating the emotions of her characters, but those of the reader as well. Small Town Hearts has just the right amount of drama, at just the right pace. Vale manages to honor small town life, while deftly navigating the often rough relationship waters experienced by older teens. She tells an emotionally compelling story, stays true to her complicated characters, and somehow manages to tie it all up in sweet-yet-realistic bow. A charming and satisfying read.